Castlegate Singers are based in Cockermouth, Cumbria. The choir’s goal is to practise and perform a wide-ranging programme of music to high standards, for the enjoyment of both members and audiences. 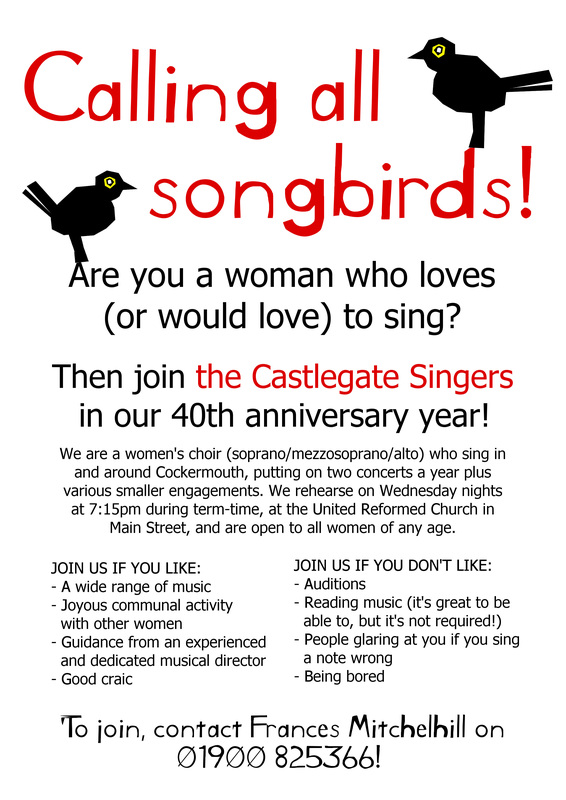 Castlegate Singers is a women’s choir and enjoys a steady membership of over forty, drawn from Cockermouth and the surrounding towns and villages. The choir performs a number of local concerts annually – including Summer and Christmas concerts – and often takes part in charity events and special occasions. You are welcome to come along to a rehearsal to meet us and discover what our programme for the season is. You can then discuss with our Choir Director which section of the choir your voice best fits.